We strive to provide our customer with the best customer service and support and the most convenient shopping experience online. Whether you are at home at work or on the go you can rest assured that your orders are handled securely and with the utmost care. All our products are specifically tailored for the customer looking for the BEST DEALS in the latest trinkets and gadgets! 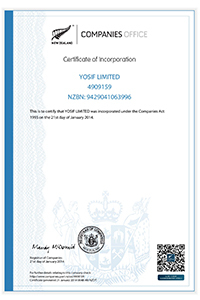 We are Yosif a global online store for all things beauty, fashion and accessories that was formed in New Zealand by individuals that share a huge passion for beauty and fashion. Dedicated to helping improve user physical and social well-being with scents carefully sourced to inspire, motivate & highlight user inner beauty. We also believe your buying experience with us doesn’t end with the click of the buy button. We take utmost care in shipping your purchase as soon as possible. We also stand by our quality and its durability commitment. 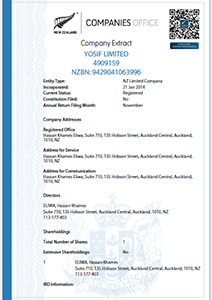 Yosif Limited is a New Zealand based company number 4909159 with GST#113242329. The company is committed to providing a wide range of trendy and high-quality collections at best price along with professional service to our worldwide community of customers. With a focus on the latest fashion, gadgets & accessory trends, our customers can be confident in knowing they’ll stay one step ahead of that ever-changing curve, and with our everyday amazing prices, everyone can always afford to look their best. Based on Auckland, New Zealand, our humble little team continuously finds new collections to bring fresh selections on a weekly basis - so be sure to check back regularly for the latest choices. Our customers are our top priority and through our products we work hard towards building long-lasting and meaningful relations with them. We love hearing from our customers and would love your feedback! Positive feedback's from customers has kept us moving forward till today as a customer grows with us and gave us the continued support. Invite friends/family and loved ones to shop with us at Yosif Store! We hope this summarizes our little humble store. Lastly, hope you have an awesome time with us!